Is this a game, or an ad? On kids' apps, it's impossible to tell. Parents should be able to trust that when they download an app marked as "educational" or "for children," that app won't manipulate their child into watching ads or making purchases. But right now, they can't. So we're taking action. CCFC and the Center for Digital Democracy are leading a coalition of 22 groups asking the Federal Trade Commission to investigate the preschool app market. Our letter is based on a study from the University of Michigan, which examined 135 children's apps and found them rife with unfair and deceptive ads. 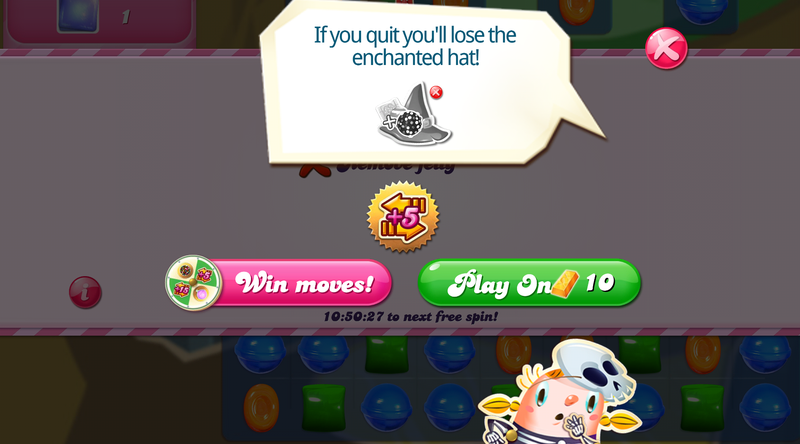 Apps in the study often contained video ads that interrupted gameplay, were difficult to close, and in one case, took up as much time as the game itself. Games claiming to be "free" required children to make in-app purchases in order to advance. Other apps took advantage of children's attachment to cartoon characters by having game characters promote in-app purchases -- some apps even showed characters crying when kids don't spend money! And it's not just small-time, fly-by-night developers taking advantage of children: In Disney's Olaf Adventures, a glowing cake invites children to tap it, but when they do, they find not a game but a pop-up asking them to "protect Anna's cake" by paying $3.99. As our Josh Golin explained in the Washington Post, manipulating kids this way isn't just unethical, it's illegal, and the FTC must hold app makers accountable. "The early childhood app market is a wild west," said Jenny Radesky, M.D., a developmental behavioral expert and pediatrician and a senior author of the study. "A lot of apps appear more focused on making money than the child's play experience." In order to protect kids and parents alike, we're asking the FTC to take swift action. Read more in Vox, the New York Times, and Buzzfeed News. CCFC, Defending the Early Years, and more than 130 leading educators and advocates are rejecting online “preschool” and demanding real universal pre-K programs. As we explain in a position statement, millions of low-income and rural families still lack access to high-quality preschool. This unequal access harms kids, families, and communities, but some Ed Tech companies see it as a lucrative business opportunity. The result is “online preschool,” algorithmically-driven software bundled with the lie that early learning happens on a screen. Despite no evidence of positive long-term outcomes, Utah began funding online pre-K in 2015. Since then, thousands of families have enrolled, and the pilot program has expanded to seven states. These online programs will only expand the early education gap – already-marginalized children will be isolated in front of screens while their more well-off peers have access to hands-on, face-to-face pre-K. Please join us and tell your state rep: all kids deserve real pre-school! 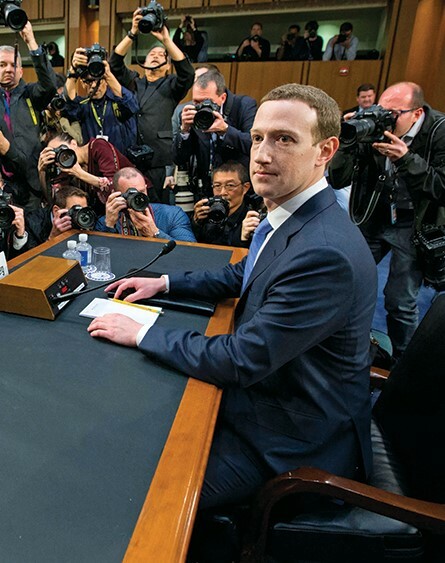 No one should manipulate children for profit, but tech companies hire psychologists to do just that. It’s called persuasive design: a series of techniques developed by behavior experts, deployed by tech companies, and intended to keep people on devices as long as possible. Kids’ developing brains make them especially vulnerable – and for kids, more time on screens means more advertising, more unfair data collection, and less time for play. Psychologists who use their training to help companies target kids are in violation of their ethical tenet to “take care to do no harm.” That’s why Richard Freed and Meghan Owenz, psychologists and members of CCFC’s Children’s Screen Time Action Network, are leading an effort urging the American Psychological Association to condemn unethical design that keeps kids on screens. In Psychology Today, Richard and Meghan dig deeper into persuasive design and why it’s so important for the APA to take a stand. Read their article, then add your name to this important campaign! 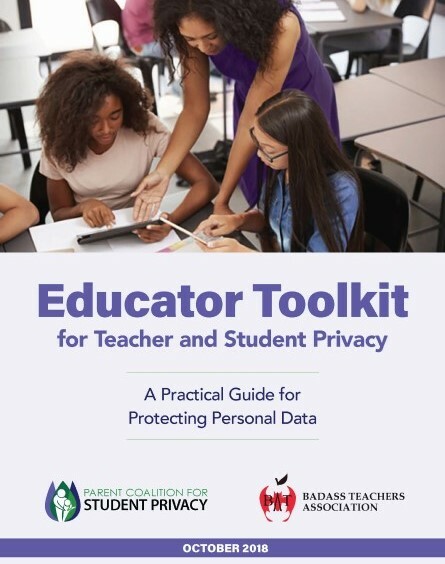 Our friends at the Parent Coalition for Student Privacy (PCSP) and the Badass Teachers Association have released an important new resource: The Educator Toolkit for Student and Teacher Privacy. The Toolkit is a comprehensive guide to help educators deal with the complex world of data privacy and the widespread proliferation of education technology. It’s full of strategies, tips, and best practices to help educators minimize the disclosure of personal data, protect their and their students’ private information, and understand the security risks that come with educational technology. In the past year, you’ve helped us score some serious victories: cancelling Mattel’s spying digital nanny, launching a network of 600 practitioners helping families unplug, and exposing Google for illegally using kids’ data for marketing, just to name a few. But CCFC members aren’t just signing onto campaigns. You’re taking action in your communities, ensuring that kids across the country – and the world – get the commercial-free time and space they need to thrive. Meet just a few of your fellow CCFC members, and hear about how they’re standing up for kids, in our 2017 – 2018 Annual Report. Low-income kids get online preschool. 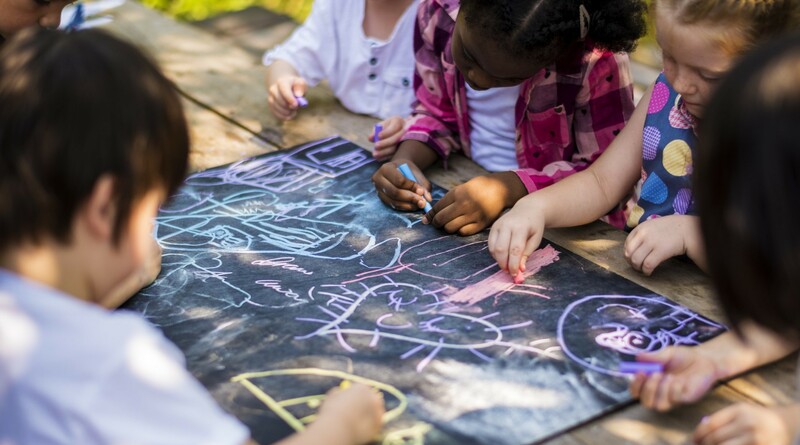 Wealthy kids get hands-on, face-to-face early education. This digital divide is serious – and seriously unjust. 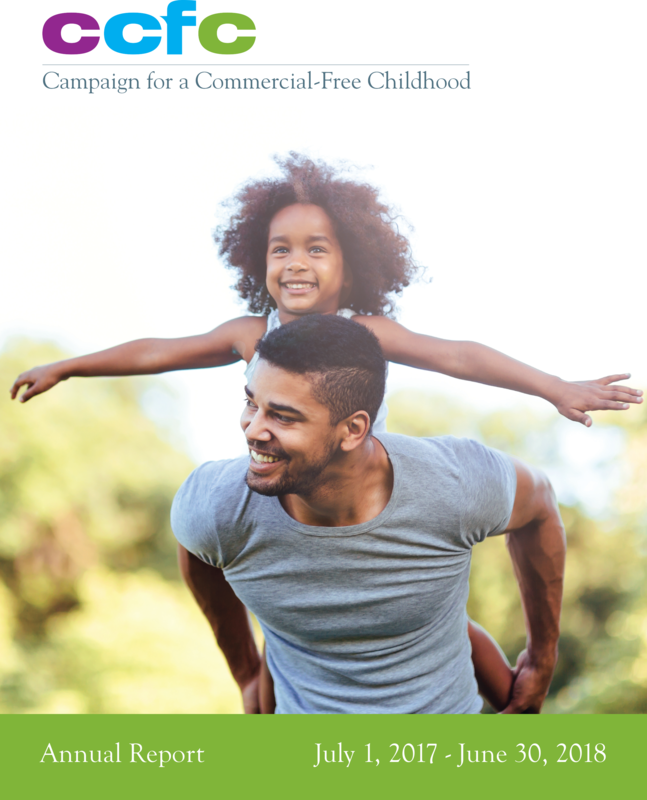 On COPPA's 20th anniversary, CCFC's Josh Golin explains why the law has failed to protect children from predatory marketing and what it will take to build a media system that truly values kids' needs. Google's new branded internet curriculum is supposed to keep kids safe online. As our David Monahan put it, that's like Budweiser teaching kids about underage drinking. When kids spend more time online, they see more ads for junk food – and when kids see more ads for junk food, they start asking for it more often. This movement wants you to unplug on the full moon and reconnect with pre-tech lifestyles. A new study has linked reduced screen time with higher cognitive function in children. At Children and Nature Network, CCFC's Rinny Yourman offers ideas for getting off screens and into nature.